(File Photo) Transportation Secretary Frank Busalacchi (left) with Governor Jim Doyle (right) as they announce the purchase of two Talgo train sets. Representatives from Midwestern states meet Wednesday in Washington to push for a high-speed rail network. Wisconsin is one of eight states joining forces to get federal funding to develop the Midwest corridor. 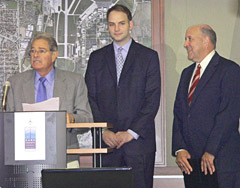 Several officials met with U.S. Transportation Secretary Ray LaHood to make their case. Wisconsin Transportation Secretary Frank Busalacchi says the intention of the meeting is to show unity among the states. A representative of Busalacchi’s office made the trip to D.C. Busalacchi participated in the conference call. So, when will the feds decide who gets the stimulus money from the American Recovery and Reinvestment Act? Kristi Lafleur with the Illinois governor’s office adds that there is nothing more than speculation right now about who will benefit from federal stimulus money, and there’s no way to know when the decision will be made. She says the main reason for the meetings was to show unity and to make Secretary LaHood aware that the Midwest states have responded to his advice by creating a steering committee, and have meetings and communicating regularly. NOTE: The Midwest High Speed Rail Steering Group met with the U.S. Department of Transportation Secretary, Federal Rail Administrator, Amtrak leadership, staff from the U.S. Senate Commerce Committee, and members of the Midwest Congressional High Speed Rail Caucus.